John Mark lived in an exciting and terrifying time for the early church. The number of people joining the new movement was steadily increasing ... but so were the persecutions of its members at the hands of the Roman authorities. In the midst of this era of fear, grief, and hardships, Mark penned his Gospel to instill hope in believers everywhere-reminding them of what the Son of God had taught while he was on earth and the power he had exerted over creation itself. Jesus had triumphed over the grave, and he would be with them in the midst of every storm. The Jeremiah Bible Study Series captures Dr. David Jeremiah's forty-plus years of commitment in teaching the Word of God. In each study, he will help you understand what the Bible says, what it meant to the people at the time it was written, and what it means to you today. Along the way, you will gain insights into the text, identify key stories and themes, and be challenged to apply the truth you find to your life. 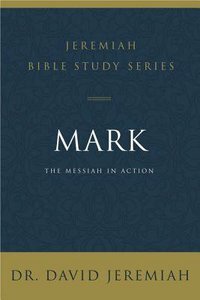 About "Mark: The Messiah in Action (David Jeremiah Bible Study Series)"